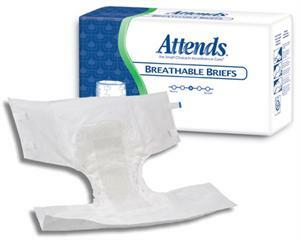 Contains additional super absorbent polymer and cellulose fibers for more absorbency than our BRBC briefs. Air-comfort breathable side panels for healthy skin. Soft, cloth-like inner liner AND outer covering for comfort, discretion and skin wellness. Triple-tier moisture locking system (pH-reducing fibers, microporous acquisition layer, super absorbent polymer) for exponential improvements in absorbency, skin health and odor control (BRB50 does not have acquisition layer). Soft and flexible Comfort Flex-Tabs® fasten anywhere for precise fit. Mom is almost bed ridden & completely incontinent. This product has worked the best out of all the brands that we've tried. Her skin has never broken down, they stay on and we've been very happy with them for the 2 years we have been ordering them. And My Self Dignity is the BEST company! We get all our orders within a day or two. Jonathan is so helpful & kind that I feel as if I've made a friend. Thank you for all your help during a difficult time! You are one of the silver linings in my life!